Worse yet, frozen pipes can result in pipe bursts, which can flood your basement and home. If you have a water blockage, your pipes should be thawed immediately. Call Scottco for help in thawing and or repairing a line that has burst. If your home experiences frozen water pipes every winter you need to correct the problem to prevent costly repairs. Every winter as temperatures drop below freezing homeowners are plagued with frozen pipes. Pipes that have frozen in the past are obvious candidates for special attention. Insulating lines will help, but won’t be itself keep pipes from freezing if they are exposed to cold temperature for a long period of time. The pipes or fixtures that freeze first are usually the ones that are on the outside wall. On these pipes leave a faucet dripping and open cabinet doors. Water lines in a garage or attic that are directly exposed to below freezing temperatures can be wrapped with a special UL listed and approved heat tape then insulated. This should always be done by a licensed plumber. If you experience frozen pipes, call us for help. A friendly plumber will respond, diagnose your situation, listen to your concerns and offer options for solving the problem. You will get guaranteed upfront pricing that you approve before work begins. Our plumber will respect you and your home, clean up the work area and explain the work performed. 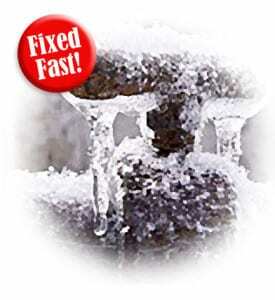 Call if you need help preventing or repairing frozen water pipelines – 806-355-4663.